This last part of the trip has been full of mixed emotions. Partly really sad to be heading towards the end, partly looking forward to getting home, still wanting to be in the moment and loving the freedom of the journey. We have no idea how will would get our bikes home or if we can actually get off this Croatian island and back to Italy without riding back the way we came. After a few days rest on Croatian island of Cres and swimming in the ocean with all our plans of island hopping with ferries not going to work, we rode through the medieval coastal town and waited for the bus. Somehow we just managed to squeeze both bikes underneath the coach and were on our way off the island. This was a bit of a relief as the peak season was ending and lots of the ferries were about to stop running. We arrived in Rijeka, a city on the mainland of Croatia very glad that we had taken the bus and ferry. Croatian roads and drivers were some of the worst we had experienced on the trip, and this road was no exception. The next challenge was trying to find the next bus to get us back to Italy. Eventually we saw the sign on the front of the bus change and went over to try and get on. It was busy, and more and more people kept arriving at our bus. We were starting to think there would be no room and eventually got to the driver who was loading bags and used sign language and pointed to our bikes. He was not really that impressed and was very busy. After another 5 min of nervous waiting he took us to the other side of the bus and we wasted no time in squeezing our bikes on and getting on the bus. Back through Slovenia and down the mountains into Trieste. We were very relieved to be back in Italy and have our freedom of being able to ride to our final destination of Milan. We rode back along the coast of Italy and the Adriatic Sea really enjoying the nice weather staying in caravan parks on the low season as they were cheaper and quiet. After a 100km day we arrived back on the coast closer to Venice and were shocked to see how busy it still was. It’s great to be fit enough to ride 100kms and still have the energy to set up the tent have a beer and go out for dinner. The beach was covered in 1000’s of sun lounges with umbrellas, the caravan parks seriously had 4000 sites for people to stay and they were like mini towns in themselves. We stayed in our first 5 star caravan park which had its own roller coaster and amusement park. We decided it was time to go back to the mountains and hang out on some lakes for the final part of the trip. This meant a quick trip through Venice involving a ferry to somewhere and a train ride the next day. All of which was a good plan in our minds, but we knew that it wasn’t always that easy. We arrived at the ferry port to find out that bikes weren’t allowed at all in Venice. We would get fined, and the passenger ferry would not take bikes. Bugger! There was another option though. If the captain allowed it, we could take our bikes on a passenger ferry to another peninsula. Then ride to the car ferry which would take us to the other side of Venice somewhere near the train station. Amy always goes first in these situations and I tell her to flutter her eyelashes to the crew to see if they will let us on. We waited nervously on the jetty as the passenger ferry was filling up fast. Amy walked to one of the crew with helmet in hand to help with the sign language of is it possible to get our bikes on this ferry. There were some loud conversations between the crew and captain at the top of the ferry and next thing we knew Amy had come up with the goods. Passengers were stopped and we were waved onto the ferry. Phew. We were relieved to be on the way again and got off one ferry and quickly rode to the make the next one 2 km along the peninsula. It arrived just as we did, racing along the waters edge we got to the line of cars and had no idea if our tickets would work and had no time to go and buy more. No one even checked our tickets. 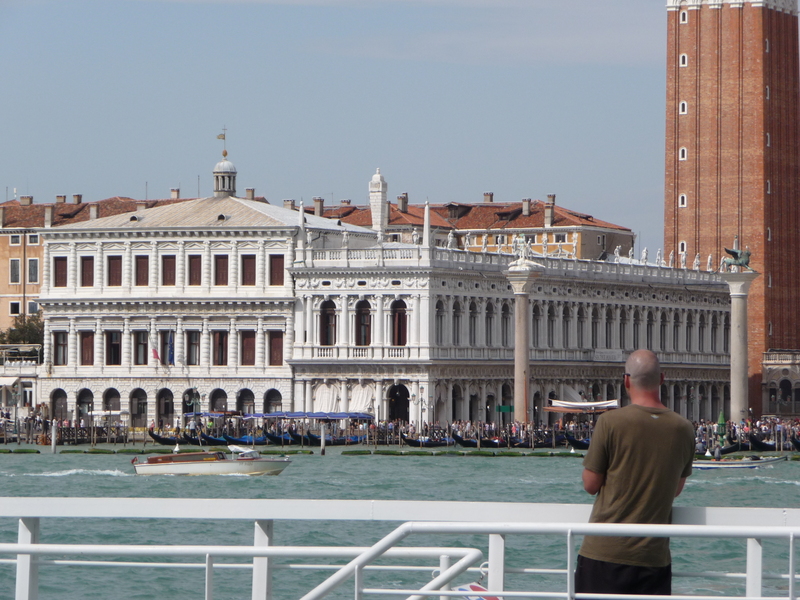 We were off on an amazing ferry ride right through Venice checking out the sights from the water. Blown away by the architecture, Gondolas (of the boat variety this time) and the fact that this city was on water we cruised past knowing that we would be back here in a few weeks to hang out with Amys parents. There has been such a contrast of bike friendly and unfriendly places along our journey. It was weird to see a city that did not even allow bikes. Our 5 star caravan park didn’t even allow bike riding. There have been countless flights of stairs that we somehow heaved our bikes up and down at train stations, and this time it was a huge flight of stairs on a bridge over a canal and we eventually found the train station. Pushing our bikes along so as not to get finned for having bikes in Venice we heaved our bikes up the 1m high steps and squeezed through the gap in the doors onto the train to Lake Garda. We were amazed to find that there was a direct train to where we wanted to go and thought that this might be a stress free train ride to the mountains. As we were getting close to our destination a really helpful friendly Italian army guy started talking to us about where we were going. None of which we could understand. We showed him our tickets and he said that this is your station you should get off now! Another guy quickly got out his phone and said no it is the next stop. We were starting to get worried because he was trying to tell us something about the next stop. The other guy was trying to translate for us but we still didn’t really know what was going on. We used google translator on his phone and realised that the train might be too long for the next train platform. We were going to somehow have to get our fully loaded bikes though the middle of the narrow carriages towards the front of the train to be able to get off. We were starting to panic now the army guy had rushed to the front of the long train to try and find out some more information. We quickly half unloaded our bikes and awkwardly shoved our way towards the front of the train. We almost made it through one carriage by the time we were arriving at our destination, the army guy arrived back to help Amy drag her bags through the last of the carriage and we got the impression that it was all going to be alright. We got off the train thanked him for his help and very misguided information that made for the most stressful end to a train journey yet. Amy has got much better at not stressing out on trains but we were both pretty highly strung on this one. We arrived at Lake Garda after riding for 40kms 2 ferry’s and a train ride ready for a rest day. We found a little cabin in a caravan park overlooking the lake. We really enjoyed being back in the mountains with an amazing lake to ride around and go swimming for the next leg of the journey. After eventually finding a map of the largest lake in Italy we realised that the leisurely cruise around the lake had some challenges. Tunnels! About 50 of them in total going through vertical cliffs. We set off around the lake and I and discovered that we were riding into a windsurfing mecca. With windsurfing hire shops everywhere I was getting very excited to get back on a board as it had been about 12 years since I had my last go when I was instructing at Inverloch. We tried to ride on the lake edge for the first part of lake Garda and ended up pushing our bikes across a sandy beach. Cringing at all of the sand getting into our bikes. The paths were pretty gravely with very loose stones. Amy has done an amazing job of riding through some very difficult terrain throughout the journey. We have done about a quarter of the trip off the bitumen and even when on the road the quality of the roads here is pretty bad. We had just decided to go back on the road when Amy turned around to say “stopping” and the front wheel started to slip. There was nothing I could do to help. She nearly held onto it but went sliding out and crashed into the ground. With grazed knees and hand I helped her up, and tough as always she jumped straight back on and kept riding. We patched up the wounds down the road. This was the only stack for the whole trip Amy has got so good at riding along the way sometimes beating me at trackstands (not putting your feet down) at the traffic lights. Since then Amy has had to change the way she holds the handle bars from the cut hand just like I did when I had a sore back. This has led to some nerve damage in her hand and the return of the bloody “handle bar palsy”. Hopefully she’ll get full movement and strength back in her hand soon. We made it to the top of the lake after navigating some pretty hairy tunnels. Head torches on bike lights flashing front and rear, we realised that we should have ridden the other way around the lake so that we were on the lake side of the tunnel, and not next to the cliff with no shoulder. We also knew that we had done the easy section and there were way more tunnels to come on the other side of the lake. The top of the lake was the place to be for windsurfing, all of the wind funnelled up the lake and was constricted by the mountains. There was still no wind but there were racks and racks of sails and boards all along the beach at this end of the lake ready to go. With no wind we rode through the town and stopped for gelato to prepare ourselves for the tunnels ahead. Mid gelato the wind sprung up. The sails that were just bobbing around on the lake started whizzing by and I knew I had a chance. 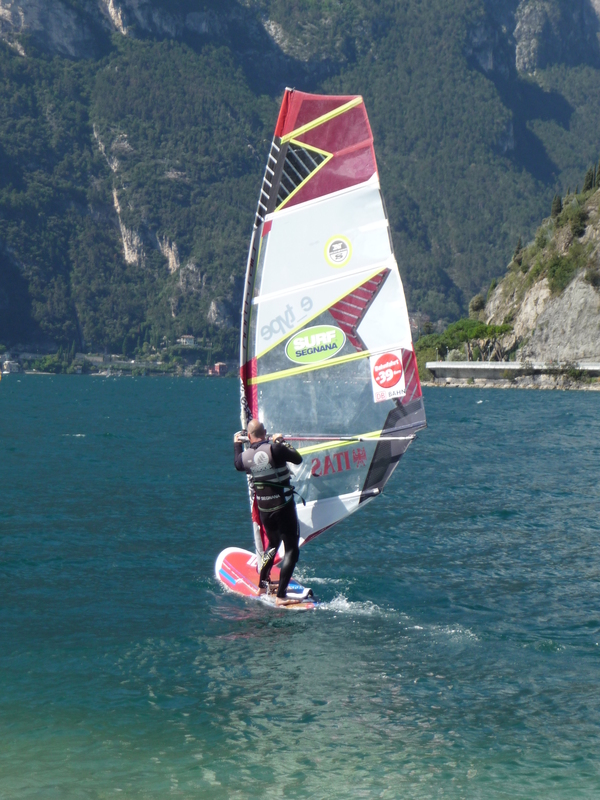 We back tracked 10 km around the lake to a hire place, hired a windsurfer and I was off. Having chosen a tiny board that would only just float me I headed off to the other side of the lake a few km away to try and find some stronger winds. It was the most spectacular place to windsurf that I could have ever imagined. After a little while there were about 350 windsurfers on the lake. I cruised around loving being on the water again, I sailed back to shore to tackle some more tunnels on the bikes. We saw a bunch of bikes riding up a dirt track that traversed the cliff and thought it was worth a go if we could avoid some tunnels. Turns out after a few kilometres of climbing on full on mountain bike tracks that we were on a track going away from the lake and up into the mountains. It was a spectacular descent back to the start of the tunnels looking over hundreds of windsurfers being passed by dozens of mountain bikes. It was now getting pretty late in the day with heaps of tunnels to tackle and no idea where we could stay as there were so many cliffs on this side of the lake and not many towns. The tunnels were so freaky, some of them pitch black others 3 km long with branching tunnels inside. Every tunnel had potholes patches of gravel, broken glass and smashed up parts of cars littering the sides that gave us very little confidence on the drivers. We were passed by a convoy of about 200 motorbikes in one of the longer tunnels and the noise was incredible. Eventually we stumbled onto a caravan park right on the lake, nerves frazzled from all the tunnels we hadn’t made it far but were very glad to stop and swim at of our lakefront tent site. The next day we decided to get up early and tackle the last of the tunnels early in the morning hoping there would be less cars. We were right, it was much quieter and less stressful. We stopped for a coffee at one of the local windsurfing spots along the lake and the wind was howling. Hundreds of windsurfers were flying along doing the most amazing tricks and flips I’ve ever seen. A lot had changed since windsurfing at Inverloch. I could of stayed there for hours watching and trying to work out how on earth they actually managed to do those tricks. We had more tunnels though. We set of and eventually finished riding all the tunnels that day very relieved that we had made it through them all safely. It was a spectacular section of riding that we both really enjoyed. Ahead still lay a few hundred kilometres to get to the airport and somehow work out a way of packing up the bikes to be able to get them on the plane home. It was really starting to feel like the end of the trip now and we had to make some distance to get to the airport. We discovered that there were actually some bike paths going in the direction that we needed and set off for the next lake. I have been downloading maps to my phone to use on the gps app when we have wifi. There have been many sections where I haven’t had wifi and therefore no maps and also no sim card in my phone. While riding along I have to get out the phone with one hand, turn off aeroplane mode turn on the app and wait for a signal. Then trying to ride with one hand, zoom to the place we are riding and try and see if we are going the right way. Along the way we stopped and chatted to another Italian cyclist who told us to follow him there is a better way than the cycle route through the next town. After months of navigation using dodgy maps from the info centres it was great to have a local to follow and not have to think about every single turn. A few k’s down the road he got a flat tyre. We looked at each other wondering if we should keep going and leave him to fix the flat. We were off the cycle route with no map and had to ride about 100kms that day after a late start. After looking at his pump we decided to stop and help him fix it. Very slowly he changed the tube and I pumped up his tyre. We now had a cycle guide. He escorted us for the next 40km going past his destination and through a whole city. He stopped having long conversations with locals about the best route for us for the remainder of the day. We have been amazed at the generosity of people along the way and how friendly and helpful people are on our journey. 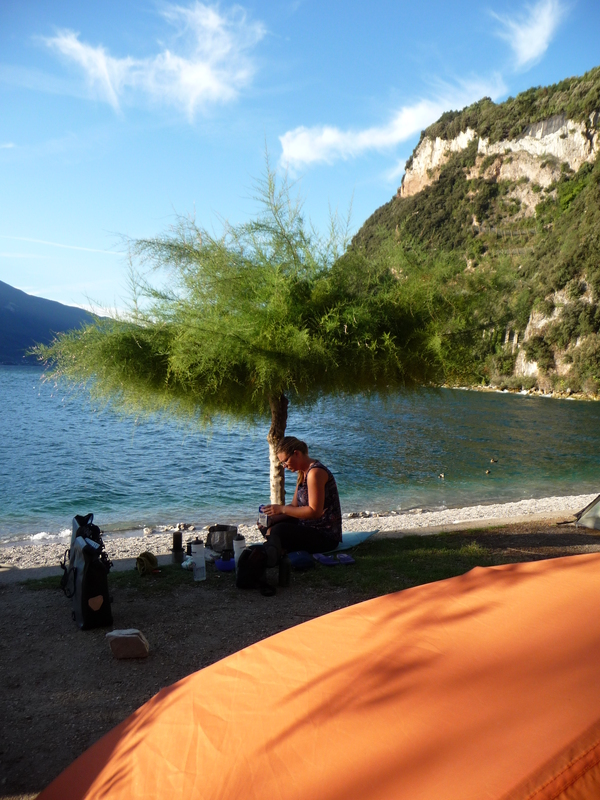 We arrived late that day to Lake Iseo and stumbled onto another beautiful lakefront campsite at after sunset. 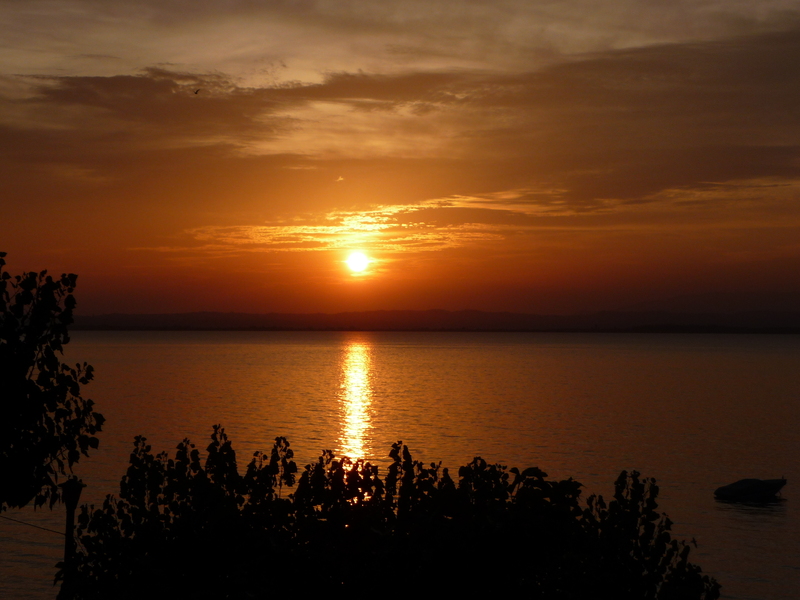 Within a week almost all Italian campsites will be closed for the low season. Our timing couldn’t have been better. We still had no idea how to get bike boxes and our bikes to the airport to be able to go home. After reading as many blogs and googling the airport we knew it was going to be difficult to find a bike box. We had emailed 3 bike shops about boxes in Milan and received no reply. The campsite was really friendly and I asked the reception to ring a bike shop near the airport and ask if they had a bike box. Eventually I think they were able to work out what I was saying with charades of giant boxes, planes and bicycles. The first 2 shops said they had no boxes and on the third try, one said that they did. In very broken English I asked if they would keep them for us for 4 days until we could ride there. We still had hundreds of kilometres to go to get to the airport and decided to get the train to the next lake and take a chance that the bike shops there might have a spare cardboard bike box or two out the back for us. We trained into Milan and then out again and rode 40km to a town where we knew from our maps had 2 bike shops. Neither shop had a box, and there was no where to sleep in the town. Bummer. It was a long shot, but at least we were now within riding distance of the airport. We backtracked and found a hotel in the previous town. After a cold night we set off for the airport following a river. We turned around to see someone taking a photo and couldn’t believe our eyes. We had gone from the hottest European summer ever to looking at snow covered mountains in the distance. Our last day of cycle touring down this river was perfect. Great tracks, river views and snow capped mountains in the distance. 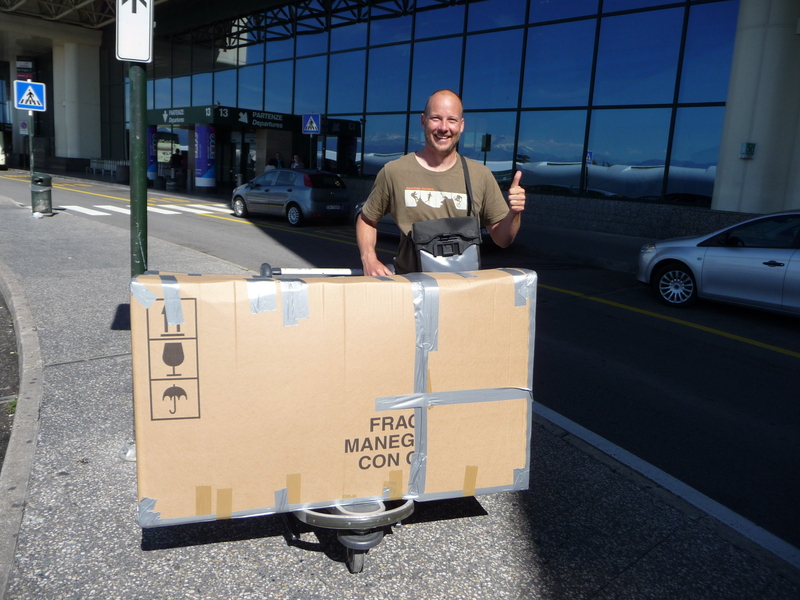 This changed considerably when we chose to take a chance and check if the airport had any bike boxes laying around. Airports aren’t really designed with cycle tourers in mind and after a long detour we found our selves in 5 lanes of traffic one way approaching the huge elevated road to Milan airport. Sure enough there were no bike boxes to be found. There were even some local Italian people departing with their bikes in bubble wrap asking me how I was going to get our bikes on the plane. We had found out it was possible to store our bike at the airport for the next 2 weeks while we finished the trip and caught up with Amys parents in Milan, Lake Como and Venice though. We set off for the bike shop hoping they still had some boxes stored for us. Somehow we made it out of the airport without ending up on a freeway and arrived at the bike shop. Turns out they were bicycle manufacturers and had heaps of brand new boxes available. In broken English we organised to come back the next day and pack up our bikes. After an 80km day we rode to our accommodation that we booked the night before. This had been the only time on the whole trip that we had pre booked our accommodation. Turns out it was 3 km out of town in a really crappy area and decided that there was no way we were going to stay there and kept riding. It seems like all of the cities we go to towards the end of the trip have an event on and although it is low season it was hard to find somewhere to stay. We found a B&B that was fully booked but had a room with no bathroom if we couldn’t find anywhere else to stay. This would do fine. We washed our bikes struggled to find a restaurant and got ready to pack up our bikes the next day. It took us 4 hours in the blaring sun the next morning to dismantle our bikes, resize the boxes to fit on the plane and get ready to somehow carry them to the train station and get to the airport. The bike shop was so helpful in lending us packing tape, tools packing parts. Amy asked if it was possible to get a taxi to the airport after a little while the boss came back out and said that they would drive us. Wow. Again we were so grateful at the generosity of people along the way. We got dropped off at the airport not having to drag our awkward boxes 500 metres to the train station and on and off trains like in the beginning of the trip. We stored our bikes and trained back to our B&B town to celebrate what an amazing adventure it has been. Since the end of the bike tour we have hopped on another train taking us up to the mountains and into another medieval town. We were all organised, even knew what time the train left and had time for a coffee on the way to the station. I went to the ticket office asked for 2 tickets and realised that there are 2 stations called Busto Arsizio and we are at the wrong one. I loaded up the maps on my phone, looked at the time and we had 15 minutes. ‘We can make it’ I said. My first idea was to use those hire city bikes outside the train station. I wasted 30 seconds trying to work them out and then said ‘lets make a run for it’. The running part lasted about 50m as we realised how easily our bikes had carried all our gear compared to having it slung over our shoulders. We speed walked for the next 1.5 km and somehow made the train with a less than a minute to spare. Amy has found a book in our apartment and we have just been resting, writing this blog, making a movie and nothing much else. Its still hard to believe how far we have gone and how many places we have seen. At the start of the trip with practically no training we set off very wobbly from the top of the Swiss Alps hoping that we would like cycle touring. It has been the best journey and means of travel I have ever experienced. Amy has been so amazing, always taking on the many challenges along the way and supporting me through the tough bits when we were both very tired. I feel very fortunate to have had the opportunity for such an amazing adventure with Amy and also very fortunate to be able to go back to an amazing place called home. Really look forward to catching up with family and friends when we get home.